Everyone has their favourite few essential oils, those go-tos that you always grab. (These are my 5 most frequently used essential oils!) Peppermint essential oil is one that is very versatile, and pretty affordable as well. It IS very potent (1 drop of peppermint essential oil delivers the effectiveness of 27 cups of peppermint tea), so be sure you DILUTE it with a carrier oil (any good quality vegetable oil) if you are applying it to your skin. Its strong tingly feeling will feel very hot on your skin if not diluted properly. So here are 5 ways to use Peppermint essential oil for today’s Five on Friday post! 1 – To support digestive discomfort. 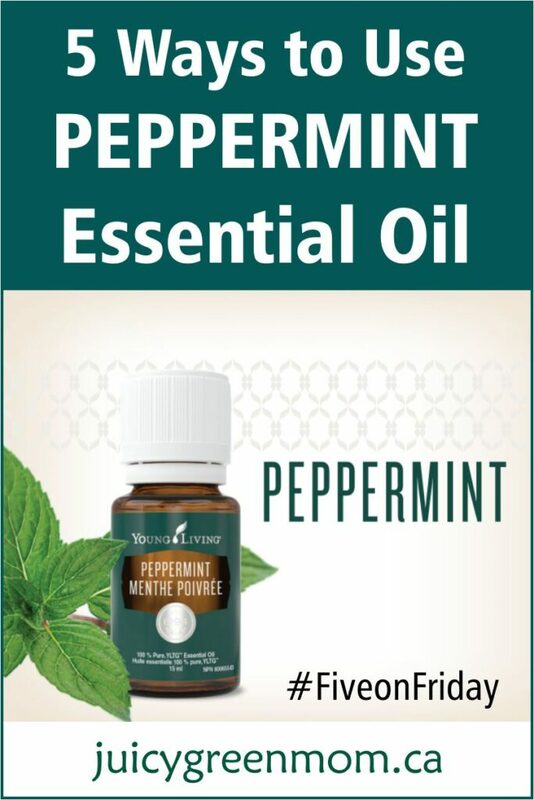 This is one of my favourite ways to use Peppermint – I include it in a roll-on bottle with the DiGize blend and roll it and rub it in on my tummy. It ALWAYS feels better after I apply it! Peppermint can act as a carminative (combats gas!) and antispasmodic. 2 – To help relieve joint or muscle pain. I know many people who rely on Peppermint to help with muscle pain, especially for sprains, strains and rheumatoid arthritis. I have a Peppermint roll-on for this as well! 3 – To reduce symptoms of cold and cough. The minty freshness of Peppermint always feels good when I am congested – I find it is effective for both nasal or chest congestion. 4 – To calm and relax. Peppermint can act as a nervine (to calm the nerves) and calmative when you inhale its scent, to help you calm down and relax. I often diffuse Peppermint when I’m feeling wound up and it helps to achieve a feeling of release and rest. 5 – To repel bugs. Peppermint is actually a great deterrent for most bugs! Last summer when I noticed chomps out of my garden strawberries, I placed cotton balls with Peppermint essential oil in and around my strawberry plants. Voila! Nothing was eating my strawberries anymore, except for my daughter after she picked them! Peppermint essential oil is definitely one that I make sure I always have on hand. This is how I get my Peppermint oil at 24% off retail! What are your favourite ways to use Peppermint essential oil?